Model Citizens Unite: Who Eats Chicken Wings? It’s cold; you’re hungry and looking for a place to go eat. You drum through the list of regular places: Italian? Pizza? Asian? None of these options are very appeasing. But, then it hits you! You remember a tip your best friend shared with you earlier in the week, “If you’re hungry, you should check out _____________ they have the best chicken wings in town.” You’ve made up your mind – you want wings. Am I right when I say that the best places to eat are often hidden in the smallest of corners? You pull up to where you have been told to go and in a small corner of a small plaza you see a small sign that reads, “Best Wings in town! Don’t forget to try our Fat Girl sauce.” You sit down and a waitress brings you a menu. You don’t need to look at it because you already know exactly what you’re going to have. As you sit there waiting you begin to wonder… What kind of person goes to a restaurant to eat chicken wings? As you look around, you notice that no one else is looking around. 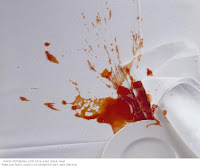 No one is hiding the mountain of napkins on their table or is embarrassed about the number of times they need to ask for a refill on their water because of their hot sauce. You don’t need to look too closely to realize eating chicken wings is not for the self-conscious. Would we eat more chicken wings if we weren’t worried about how they made us look when we eat them? 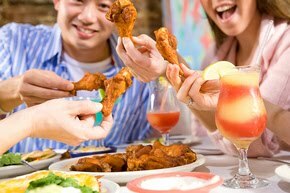 A large majority of us really enjoy eating wings, but they can be awkward to hold onto and make us look really messy. At the end of the day, like any good thing in life, the timing has to be just right. It makes it easier to go and grab wings when we know the game is on, all our trusted friends will be there and the napkins are in ample supply. Who eats chicken wings at a restaurant? We all do. Great Post!! Isn't this the truth though. The situation that came to mind while reading this post, is one pertaining the Moose. If anyone has been to North Bay on a Wednesday night, you have probably experienced the free pound of wings they give out. It is entertaining to watch college/ university guys and girls dressed in their bar clothes mowing down wings after downing a few pints. What is most entertaining is the mountain of used greased up paper towel that heaps in front of them or on their laps. Sean, if it wasn't 12:54 at night right now, I would be going out to get chicken wings. Your words put me right in the restaurant. Great post man.